The first time Dinora saw us, she was ecstatic. “The little woman has arrived!” she cried, in excited Spanish. It was May, and the six of us were sitting with Arlene, the American missionary, at a small Dominican preschool. We were waiting to meet our host mothers. We – six Trinity Western University (TWU) students aged 19 to 25 – had finally arrived in Los Higos, a village of about 700 located just outside of Jarabacoa, a town in the centre of the DR. Our purpose was to work with Students International, a Christian community development organization operating out of the Dominican Republic, Guatemala, Fiji and Costa Rica. “I am your mama now,” Dinora explained to emily and I as we walked up a steep, narrow hillside to her one bedroom, tin-roofed house (complete with an outhouse and a lean-to for bucket showering). It was the first of many experiences with Dominican hospitality. Families are far from nuclear in Los Higos, where a “close relative” is practically anyone with whom you share food. Because of this, we were daughters. Living with host families was vital in our learning about missions and development. Though the trip was centred on ministry, it was also a chance for us to share our culture with the Dominicans, and for them to teach us about theirs. The team leaders, Sarah and Alicia, served with Arlene at a women’s ministry centre Arlene has been establishing. Emily and our teammate Jacob assisted in Student International’s local preschool – learning the days of the week and basic colours in Spanish along with the kids. In the evenings we’d attend church, watch telenovelas with our host families or play cards with the neighbourhood kids. The Dominican Republic is often seen by North Americans as a tropical vacation hot spot, but despite its Caribbean beaches, it is far from a developed country. 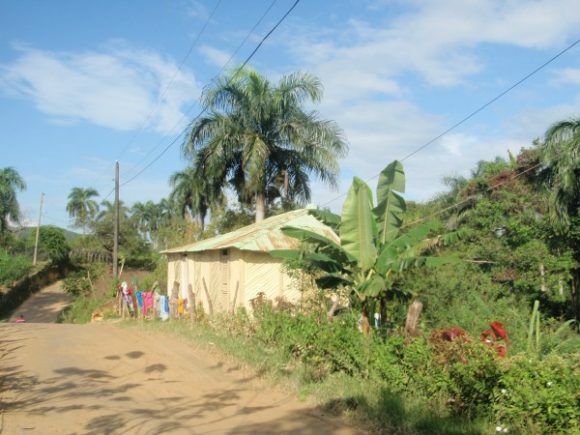 Villages such as Los Higos are host to poverty and illiteracy. They lack many basic government services, decent education and proper nutrition. There were difficult things to witness during the month: overcrowded and understaffed public schools; a 17 year old with a neurological disorder that made her unable to walk unassisted, and a family unable to afford her treatment; preschoolers with dark hair turned blonde due to poor nutrition; and a boy wrapping his shoe laces around the bottom of his shoes before tying them, so the soles wouldn’t fall off. But there were more than enough moments of hope. Once, we walked to the church’s casita, a small building where they have opened an internet cafe (though the connection is off-and-on, to say the least). Outside sat my teenage friend Hector, reading a Spanish encyclopaedia for fun. Nearly every day, I saw Dinora feed both young and elderly neighbours when there was no food at their own homes. One day, we sat in a church service where men and women discussed the reason for baptism, using verses from Scriptures they had studied and applied on their own! The Pentecostal movement is prevalent in the DR, but in Los Higos, revival isn’t about huge crowds or massive conversions. It is much more subtle, working its way slowly through key layers of society. It’s in teenagers being nurtured at pivotal points in their lives. It’s in a safe place provided for women to learn both the gospel and useful life skills. It’s in a preschool making sure no child misses out on an education.